Most people who come to study at Global School of English know that haggis is the one food for which Scotland is most famous. For those who don’t know, a haggis (several haggis are pictured here) is a sort-of sausage, a minced mixture of sheep heart, lung, oatmeal and seasoning wrapped in a sheep’s stomach. It’s definitely not suitable for vegetarians, but for those who do eat meat it is very tasty indeed. However, not many of our students know that we do other things as well as eat it! Haggis hurling is exactly what it sounds like – hurling (throwing) a haggis. Although it has been claimed to be an ancient ‘sport’, in reality it is a modern invention, going back to the 1970s when an advert was placed in a newspaper at the time of the Gathering of the Clans (historic family groups under the same name, such as the Clan MacLeod or the Clan Campbell) in Edinburgh. This advert announced a ‘revival’ of the ancient Scottish sport of haggis hurling. The intention was simply to see who can throw a haggis the furthest. Nowadays, there is even a World Haggis Hurling Championship, with all the money earned going to charity. The ‘sport’ has strict rules: the haggis must be cooked and of a specific weight; it must be inspected to make sure it is a proper haggis, with all the traditional ingredients; and when it has been thrown it must remain intact when it lands. The most recent annual competition took place in Ayrshire, south of Glasgow, at the place where Scotland’s national poet, Robert Burns, was born. This year it was in January and a new world record was set, as you can see in this YouTube video. 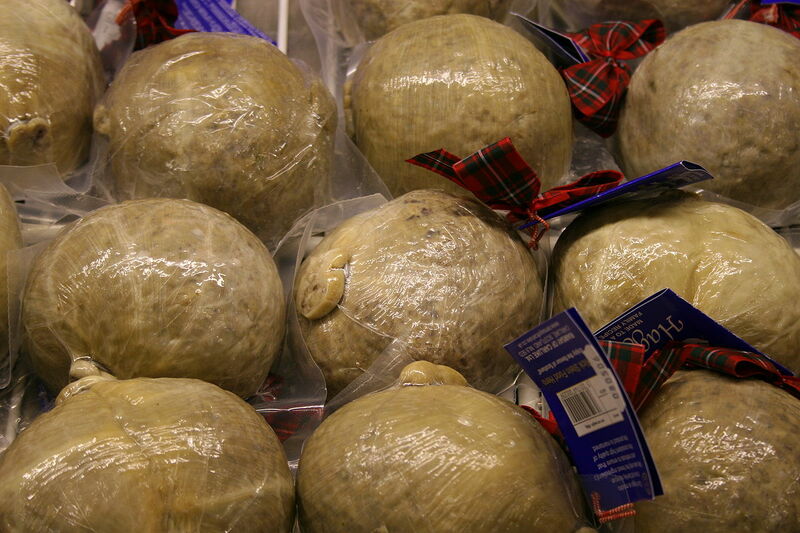 Haggis hurling has become famous in different countries, with Canada and Australia also holding competitions. Even if you don’t manage to see haggis hurling competition taking place when you are studying in Scotland, you should (unless you are a vegetarian or vegan), try to eat it at least once when you are here! Some unusual Scottish “Traditions” – the Moffat Sheep Race! The town of Moffat in the Scottish Borders (south of Edinburgh and Glasgow and north of the border with England) has a long-standing association with sheep. The hills around Moffat have lots of farms with lots of sheep and there is even a huge statute of a ram (a male sheep) in the town’s Market Place. A few years ago, it was decided to have an annual sheep race through the streets of the town and this has proved so popular that many visitors come to see it. As well as the sheep race, which you can see on this YouTube video, there is a farmers’ market where local produce is sold. The sheep race with knitted jockeys on their backs and there are several races held before the winners in each of these compete in a Grand Final. The ‘jockeys’ are very colourful creations, as you can see in the video. Some people place bets on which sheep they think will win (which we think must be a real lottery!) and the whole event is a great day out. This year’s Sheep Race is being held on Sunday the 13th of August and you can find more details on the official website and Facebook page. If you would like to go to see the Sheep Race, it only takes about an hour and half to travel to Moffat from Edinburgh by road.